The peacock network has announced the 2010-11 season finale dates for their current programs. For some of the series, this will also end up being their series finale as well. If in doubt, check our list of NBC TV shows that have already been cancelled or renewed. UNIVERSAL CITY, Calif. – March 8, 2011 – NBC today announced many of its season finales for such series as “30 Rock,” “The Office,” “Parenthood,” “Parks and Recreation,” “Community,” “The Biggest Loser” and “The Event,” among others. In addition, NBC’s Emmy Award-winning comedy “30 Rock” (Thursdays, 10-10:30 p.m. ET) celebrates its 100th episode with a special one-hour edition on Thursday, April 21 (10-11 p.m. ET). 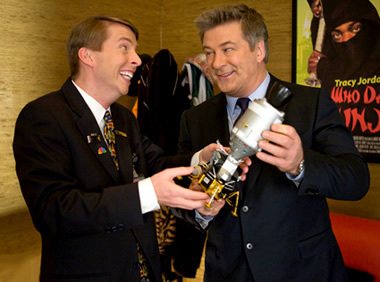 “30 Rock” celebrates its 100th episode as “TGS,” the show-within-the-show, faces the prospect that its 100th episode may be its last. A new corporate boss, a star in hiding, and a mind-altering gas leak may doom America’s fourth-favorite Friday night sketch comedy show. Storyline details for each series finale will be announced later. More about: 30 Rock, America's Next Great Restaurant, Chuck, Community, Harry's Law, Law & Order: Special Victims Unit, Outsourced, Parenthood (2010), Parks and Recreation, Perfect Couples, Saturday Night Live, The Apprentice, The Biggest Loser, The Event, The Office (US), Who Do You Think You Are? Parenthood is the best show on TV ever! Would love it if it was on during an earlier time slot. Please DO NOT cancel this excellent show that everyone relates to!